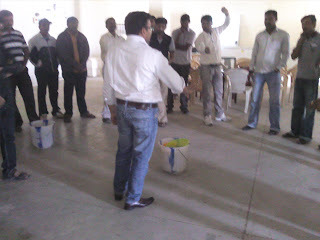 On the Day of Saturday 21.01.2012 SACHET MEHATA sir, has taken session on the subject of Performance Appraisal. He explained Appraisal is most important factor which is not only important in our profanation life but it also important in our day today life. He explained if we want to improve our efficiency effectiveness colitis we should make appraisal of our self and point out our negative point and correct them one by one. Mehata sir also told us about communication channel . 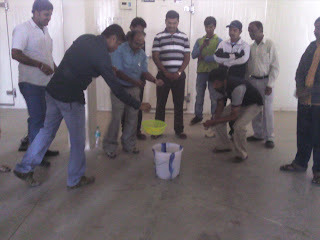 2) A team completed task within time and proper way. 3)A team trying to completing task. From the sport activities every body understood the importance of efficiency ,effectiveness clear communication , time management need , presence of mind. He had shared the benefit of appraisal point and given the task to cumplet the appraisal in the midmonth of feb.2012 . We thank you very much for valuable sharing given Mr. S.MEHATA of actual learning. This is to inform you all that Mr.Sachet Mehta will be visiting the Velocity Logistics on 21st January that is this month on Saturday 10.00am for training session. We request you all to be present for the same. 1.We have Packed & Dispatched all the goods on 31st only. 2.We had planned NA & Transit material direct form locations & transporters. 3.Mr.Avinash srivastav and Mr.Santosh shetty had visited our depot and they have given Many suggestion regarding Quality warehousing and we are working on it. 4.We have Dispacthed the promo vehicle through new process , it has helped us & reduced our pressure. 1.We have comapleted all the Dispacthes on time. 2.We have also completed stock checking. For which we are sending dedicated vehicle to speedy delivery to customer. 1.We have packed 10000 invoices upto31st dec. and stock maintained 100% and no variance found. 3.Mr.shaktising bhadauria had visited & was very happy with all working activities for which he has given 97 % in KRA. 4.We have arranaged a training sessions for pick & pack employee which resulted in no variance in the stock. We Welcome Mr.Rupesh Singh As a depot manager for Chiron Panacea who will be supported by Kiran bairaigi who has just shifted form Pidilite depot. Mr.shekhar karle has joined Exide depot as computer operator and has a rich experience in logistics. Mr.sopan mane has joined wockhardt depot as computer operator . Mr.Pravin raipure is shifted to wockhardt for the post of an accountant from Lupin Depot. Mr.Suryakant has Joined Lupin depot as Computer operator . Velocity Logistics , Wishes them a very All the best for their opportunities. I wish you and your families a Very Happy and Prosperous New Year. Looking back at 2011 and the challenging environment around us, we did reasonably well. Last year, we achieved significant milestones - while our overall performance met expectations, we also entered into 3PL deal with Chiron Panacea a Novartis group; The whole year was busy in building up the warehouse for CIPLA , Nagpur Developments & Day to day activities. We entered into a Training sessions for the employees and some professional work of accounts such as appointment letters comparison of accounts and many more new systems which released the pressure of accounts. We also strengthened our systems and processes to build a swifter, smarter and more aligned organization by Putting CA’s on accounts, HR manager for People, New schemes for employees for recruitment's, t-shirts to employees, ID cards to employee, Punch machine for attendance, ISO 9001-2001 Certification to move 1 step ahead & make the most professional organization. I always believe that we are capable of achieving much more. When we look at the world around us, companies are making new headway's into research, geographies and collaborations. As you know, our goal is to be the best C&F agent in India & provide world class services. There is much ground to be covered to meet this; and then work to meet our longer-term aspirations. I would like you to approach 2012 as a year to put VELOCITY on this fast-track of growth. Everything we do, be it dispatching, Billing, Handling, communicating or any other aspect of our business, has to single-minded be focused on putting Velocity Logistics on this trajectory in 2012.